Admire the beautiful landscapes and quaint towns of the Douro Valley on this cruise through Portugal and Spain, which includes a visit to Salamanca. Fly to Oporto on the north bank of the Douro and embark your ship at Vila Nova de Gaia on the south bank. You'll remain moored here overnight. This afternoon travel by coach from Régua to Lamego, one of the most attractive cities in Portugal. On arrival, you’ll see the elaborate Sanctuary of Nossa Senhora dos Remédios, which is set atop nine steep terraces overlooking the town. There’ll be free time to explore this impressive baroque church and walk down into the city from the Sanctuary using the ornate staircase – but be warned, there are almost 700 steps! Alternatively, take the coach down to the city and visit the lovely Gothic cathedral, which in parts dates back to the 12th century! Re-join your ship in Régua then continue your cruise to Pinhão. Depart Pinhão early this morning and take in the scenery as you sail towards Vega de Térron. This afternoon, join an included excursion to Figueira de Castelo Rodrigo, a small medieval village with a stunning hilltop location. See the 18th-century baroque church and stroll around the village in your own time. Back on board ship look forward to a traditional Portuguese dinner. Today join an included excursion across the border to the city of Salamanca in Spain, a UNESCO World Heritage Site famed for its beautiful old university buildings of golden-coloured stone. The journey here usually takes about two hours, during which your guide will give an interesting commentary on Spanish history. After half an hour of free time join a walking tour with a local guide to the magnificent Plaza Mayor, one of the finest town squares in Spain. You also see the famous cathedral, built in two parts. The original Catedral Vieja, which dates from the 12th century, is now incorporated into the much larger 16th-century Catedral Nueva. Lunch will be served at a local restaurant, followed by a flamenco show to give you a taste of traditional Spanish culture. Return to the Douro Queen which will now be in Barca d’Alva and moor overnight. Depart Barca d’Alva and enjoy the wonderful views as you spend the morning sailing towards Pinhão, arriving after lunch. This afternoon pay a visit to Quinta do Seixo, a local winery. Here you’ll join an included tour of the estate, followed by an opportunity to taste their port wines. This evening there’ll be an included trip to another local vineyard for dinner, with wine and entertainment included. The ship remains moored in Pinhão overnight. Sail from Pinhão to Regua early this morning. From here an included excursion visits Mateus Palace gardens. Your guide will give you an introduction to the palace, one of the loveliest country houses in Portugal and which famously features on the Mateus rosé wine label. Explore these exceptional formal gardens as well as examining the exterior of the palace. Enjoy the afternoon at leisure on board as the Douro Queen departs Régua and look forward to a traditional Portuguese folk music show after dinner. Moor overnight in Entre-os-Rios. Spend the morning at leisure as you sail back towards Oporto. Learn the history of Portugal’s second-largest city on an included tour. This famous centre of port wine production is beautifully located on the Douro estuary. The coach tour includes a visit to Sé Cathedral, which dates from the 12th century, and is where Phillipa of Lancaster married King Joao I of Portugal in 1387 becoming the first and only English queen of Portugal. Your tour also includes a visit to a port wine cellar where you’ll learn about the production of this famous drink and enjoy a tasting. Remain moored in Vila Nova de Gaia overnight. Save up to £100 per person in selected cabin grades! 10 July 2019 £1,779 All Inclusive! 17 July 2019 £1,579 All Inclusive! 24 July 2019 £1,649 All Inclusive! 07 August 2019 £1,589 All Inclusive! 14 August 2019 £1,639 All Inclusive! 21 August 2019 £1,739 All Inclusive! 28 August 2019 £1,799 All Inclusive! 06 November 2019 £1,349 All Inclusive! Optional travel insurance or a discount of £18 if not required†. Return flights from London Gatwick and non UK transfers. Return regional flights may be available & may carry a supplement. 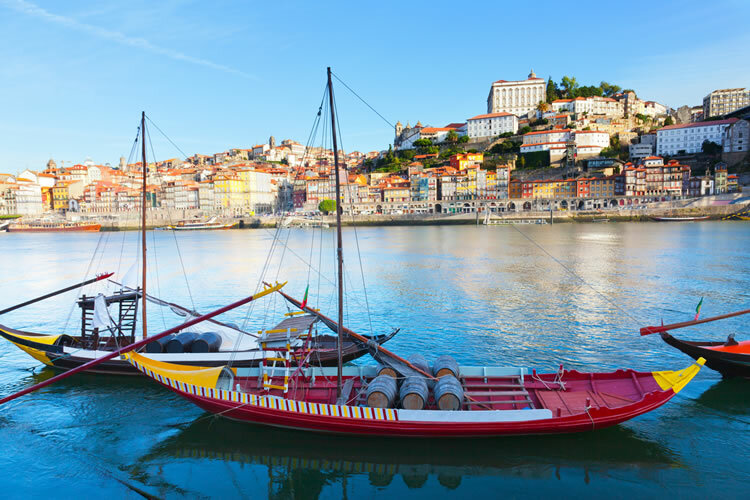 Excursions & visits: Dinner at a local quinta, Tour of Lamego, Visit Figueira Castelo de Rodrigo, Sightseeing in Salamanca, Casa de Mateus Palace & A tour of beautiful Oporto including a port wine cellar visit.